"Who you gonna call?" Sorry I had to get that one in there! When online slot developer IGT launched the Ghostbusters slot machine back in 2011, I couldn't help thinking that there might be uproar from the masses about the suitability of such a film as a theme for a wagering game. Despite my concerns, the slot has been a huge success for IGT, with no noticeable complaints. 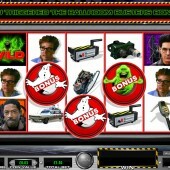 IGT have since gone on to launch an online version of Ghostbusters slot. A smart move by the giant slot company who will know a whole generation of slot players will have fond memories of Slimer, The Stay Puft marshmallow man and the importance of not crossing the streams! The game itself is feature rich, with no fewer than four different bonuses and a variety of features. It has so many that it took forever to make the video for this game (see the 'Video' tab). Having spent a good session playing it I have to say that Ghostbusters slot is very entertaining. There are clips from the original movie, which made me feel very nostalgic. I recall fondly going to the movie theatre with my parents, brothers and friends to watch this classic movie back in the 80's, it was entertainment for the whole family. However, the frequency of the wins in this slot game means that the volatility is low - as is often the case with the big branded slots. Examples being Microgaming's Dark Knight slot and Playtech's action-packed Cowboys and Aliens. 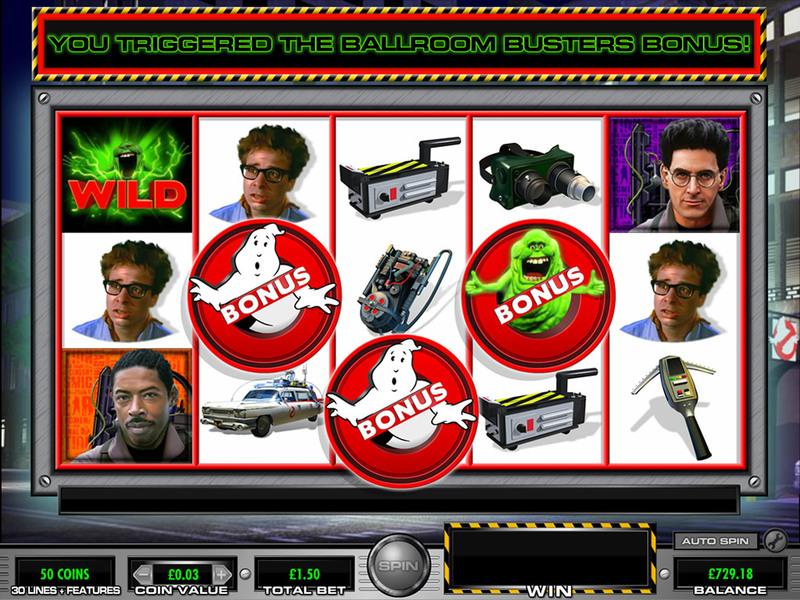 I won't go into too many details about all the bonuses in the Ghostbusters slot, as two of them are mainly based on gaining either extra Wilds or Wild reels. There are two main bonus rounds, with the most effective in my opinion being the Stay Puft bonus feature. This is triggered by landing two Ghostbuster scatter symbols on reels 2 and 3 and the Stay Puft symbol on reel 4. This releases 8 free spins, with held wilds when the falling marshmallows stick to a position on the reels. Sometimes this bonus can really go your way, especially if the wilds come in early during the feature. It wouldn't be a Ghostbusters-themed slot if Slimer wasn't involved and he plays a major part in the the Ballroom Busters feature. You need to land the bonus scatter on reels 2, 3 like before, but with the Slimer bonus symbol on reel 4. You then go through to the Ballroom where you have 5 attempts to blast Slimers out from behind the decor. It is an instant cash prize for each ghost you capture and nothing if you miss him. IGT's Ghostbusters slot is a lot of fun to play, especially considering that most people will be familiar with the film and the characters in it. I have a feeling that the games low volatility will lead the big win chasers looking elsewhere. If you like movie-themed slots, but prefer the big wins, then you could try Playtech's Iron Man 2 or the excellent Gladiator slot - also from Playtech.